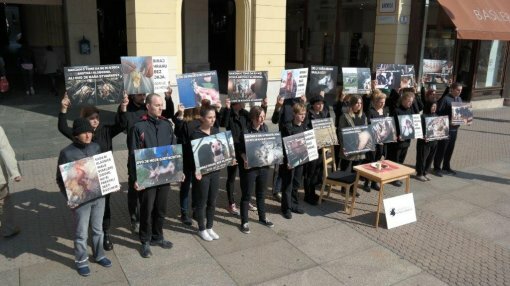 By this impressive and disturbing performance, the Animal Friends association will mark the World Day of Farmed Animals, on Monday, October 2nd, 2017 at 11 a.m. on the main square in Zagreb. 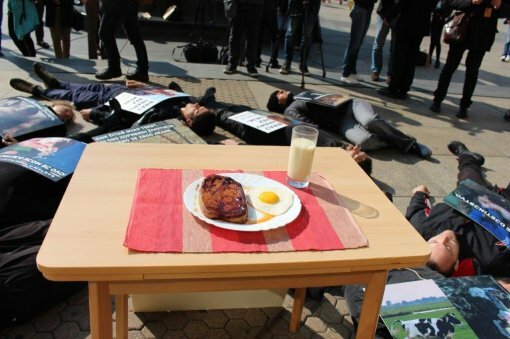 More than 20 activists, lying on the ground and covered with intriguing photographs, will show the passerby in what ways meat, dairy and eggs come to our kitchen tables and why the slaughterhouses and farms are hidden from our sight? The performance took place in a strategical location, close to an alley named Harmica, that leads to a butcher shop and the so called dairy section. The interactive performance, in which the passers-by also play an important role, will in a distinct way encourage the reflection on the thought as to how the food gets to our plates and point to a fact that everyone can, without any problems, change their lifestyles and decisions, and by leaving out the products of animal origin, save countless lives on daily basis. 2nd of October is recognized as the Farm animals' day ever since 1983., with the goal to direct the attention towards immense, frightening pain and death of billions of animals, being held captive on farms and in slaughterhouses across the world. 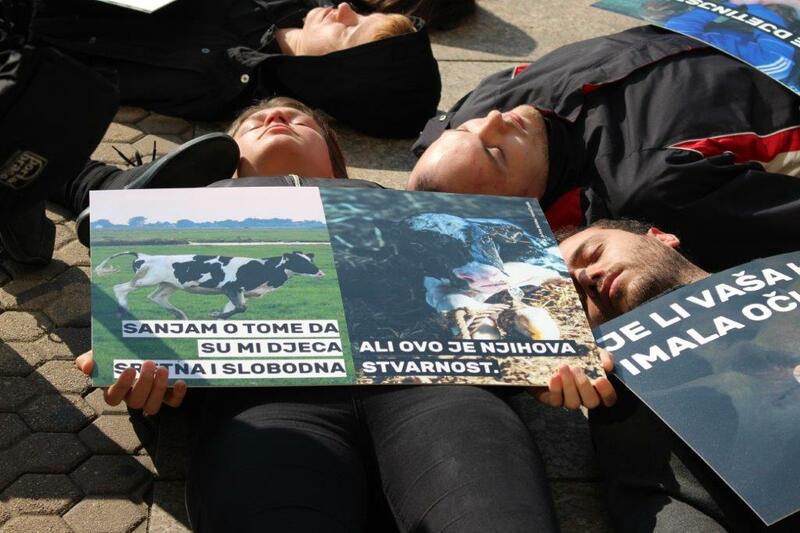 In organization with Farm Animal Rights Movement (FARM), more than 30 organizations in the world will mark the World farm animals day. 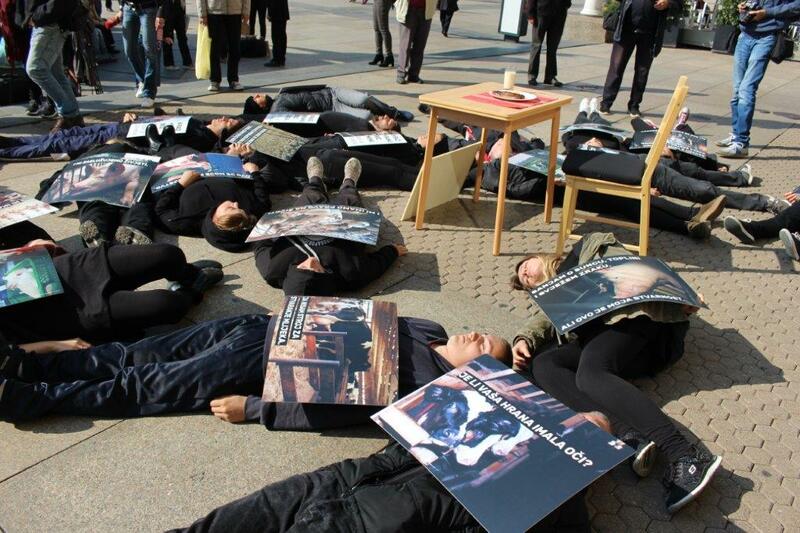 The solidarity is recognized in a common intention: to make visible the pain and repression of animals that people abuse and murder institutionally on a highest scale. Aside from health related and ecological reasons, one of the most recurring reasons for going vegan is being ethical. 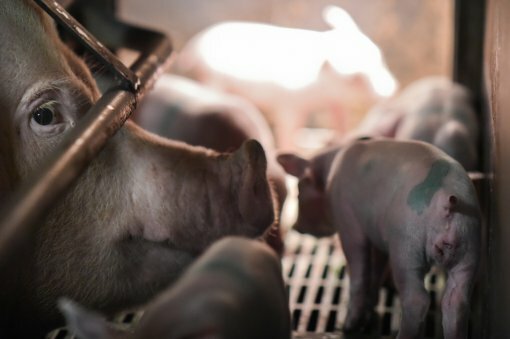 Industrial farms, in line with the idea of nazi concentration camps, use the massive walls to cover up the horror of mutilated, modified, overcrowded animals, deprived of fresh air, sun, natural habitat, movement and any other basic life needs, creating misery and pain from the moment of birth to the moment of death in a slaughterhouse. Very few will remain apathetic upon seeing scenes from everyday life on animal breeding farms because of the fact that animals are as equally sentient beings that feel pain and discomfort, just as humans. 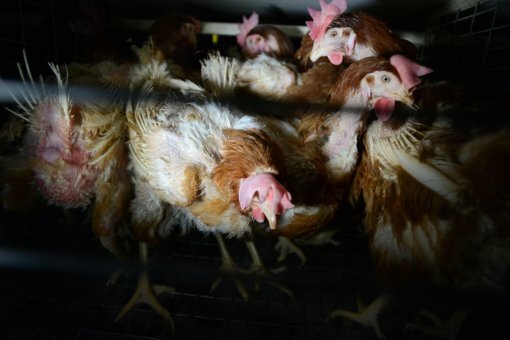 Animal friends cannot emphasize enough that the sole problem isn't extremely cruel animal handling and treatment, but also the frightening mass slaughter ocurring in the world which murders more than 60 billion living beings each year. 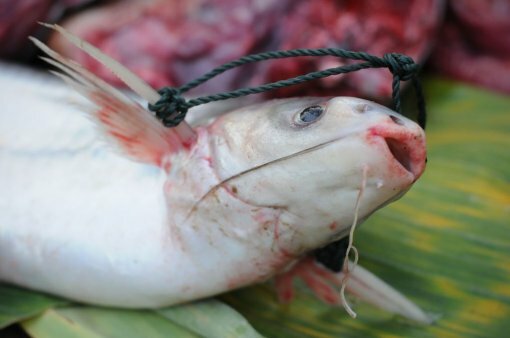 October is becoming more and more oriented towards plant based diet, and that is why Animal friends are inviting everybody to take a look at the video "60 billion lives" and join the Vege challenge – a free, enthralling e-mail service that is located on the www.veganopolis.net webpage. Check the photo gallery of the performance.